The morbidity of burn trauma is amplified by secondary processes that expand and deepen necrotic zones after initial injury. The drivers of secondary necrosis are poorly understood, and there are no treatments available to limit this process. It is thought that loss of blood flow and local inflammation are likely mechanisms. Our collaborator, Dr. Irimia, and his team have developed two treatment strategies based on the lipid mediators of inflammation-resolution resolvin D2 (RvD2) and chromatin-lysing enzyme (DNase). To evaluate these therapies, it is important to resolve blood flow changes at the microvascular level in vivo and longitudinally after burn injuries. OCT is ideally suited to imaging the microvasculature in the rodent dermis. This is especially true in traumatic settings in which label-based angiographic methods are severely confounded by leakage in the highly permeable vasculature. We used an angiographic OCT system optimized for small animal imaging with a inverted microscope stage. Comb burns were induce, and OCT angiography was performed across the initially viable tissue between the burns (interspace). Detailed microvascular angiography allowed quantification of differences in perfused microvasculature at the border and center of the interspace. 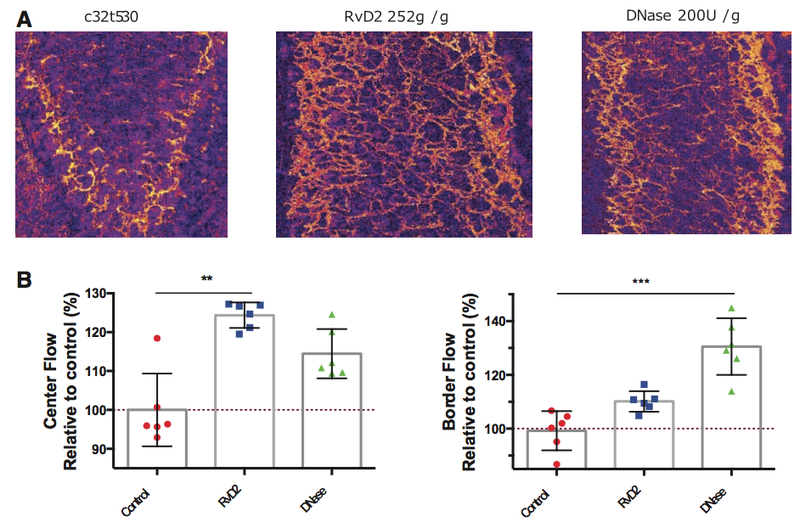 Angiographic images highlight improved perfusion at the border and center for both RvD2 and DNase treated animals (panel A), with differences in border/center perfusion patterns between the two therapies (panel B). The centimeter-scale field and two millimeter imaging depth of OCT angiography.